Wearing jeans on Fridays is more than just a company perk. It’s an opportunity to bring huge smiles to Licking County children on Christmas. Our associates put money in a charity fund for the option of wearing jeans once a month throughout the year. Some of that money finds its way to Amy Adams in our Treasury department, who works with Big Brothers Big Sisters (BBBS) Licking and Perry Counties during its Holiday Help campaign. Park has supported Holiday Help since 2003, and Amy has graciously led the effort since 2009. Every year Park sponsors 25 youth, who range in age from 3 months to 17 years. Often BBBS will ask if we can take on a few more youth they couldn’t find sponsors for (we never say no), or we will ask to sponsor more youth when our fund swells a little bigger. Shopping for 25 or more kids is a task greater than one person. So Amy turned to her colleagues to recruit some passionate helpers over the years, including Treasury colleagues Kim Ballmann and April Dusthimer and Lori Drake and her team in Compliance. They’ve stood in Black Friday lines, scoured the Internet and combined wish lists to ensure they could get the best deals. They work hard to stretch the donated dollars as far as possible. Once everything is bought, the many hundreds of gifts have to be wrapped – during breaks, lunches and after work. In 2017, that number totaled 197 presents, from the smallest jewelry and hair ties to a large baby activity center and hand tool set. It’s a true labor of love for everyone. 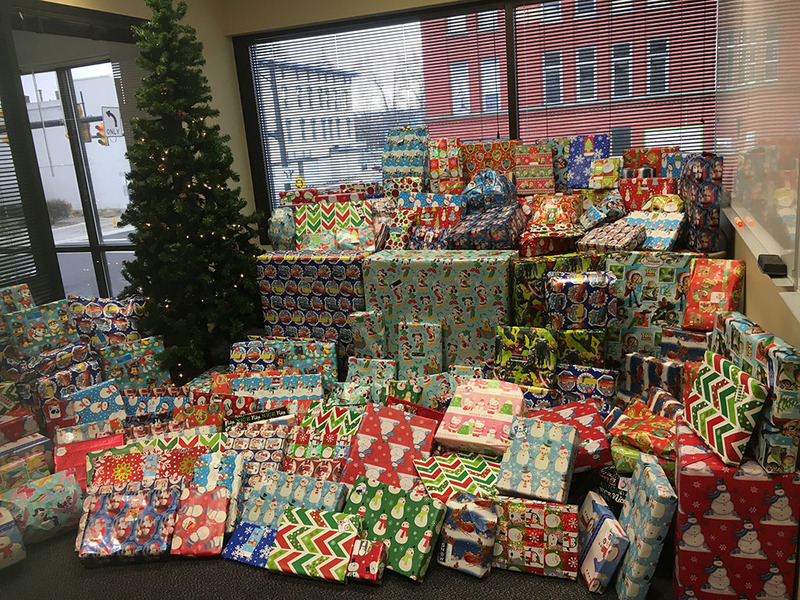 Nearly 200 presents are wrapped and ready to send to Big Brothers Big Sisters of Perry and Licking Counties.